Median nail dystrophy is a split in the midline of the nail starting at the cuticle. The condition usually affects the thumb. It results from a temporary defect that interferes with nail formation. The most common cause of median nail dystrophy is nail picking, usually by the nail of the index finger on the same hand. The condition is more often during periods of stress. Other causes include and repetitive trauma such as overuse of cellphone and guitar playing. 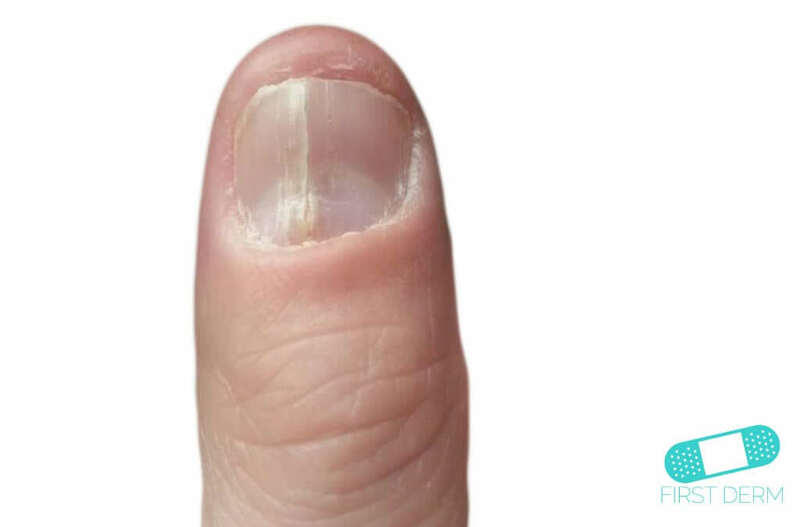 This dystrophy can be similar to a habit-tic deformity, which means that it is caused by repeated back-and-forth picking of the nail. This condition is also more common among patients with psychiatric diseases. In obsessive-compulsive disorder (OCD), the picking is part of a larger attempt to remove dirt and cleanse the skin. The patient is often unaware of the picking and performs the activity automatically. Another factor that has been reported causing median nail dystrophy is medication, such as oral isotretinoin. The condition is marked by an “inverted evergreen tree” pattern with a midline split on the thumbnail. This canal-like split extend from the cuticle to the tip of the nail, with parallel lines in the center, giving the appearance of an inverted fir tree or Christmas tree. The condition is usually symmetrical and most often affects the thumbs, although other fingers or toes may be involved. Prevent picking your nail and stop the activities that may contribute to your median nail dystrophy. The condition usually improves over time, so no treatment is necessary. Because median nail dystrophy usually heal on its own, but is not easily treated. If the condition persists and does not heal, your healthcare provider may try excision of the nail matrix abnormality after consultation. Median nail dystrophy can be very difficult to treat, as no therapy is consistently successful. If the cause is known, most cases of dystrophy resolve on their own within a few months after the discontinuation of activities that cause trauma on the nail. Some cases have shown success in treatment with 0.1% tacrolimus ointment, applied on the proximal folds of both thumbnails without occlusion every night.